Special Collections is excited to announce that more of our University Archives Photographs are now available online. 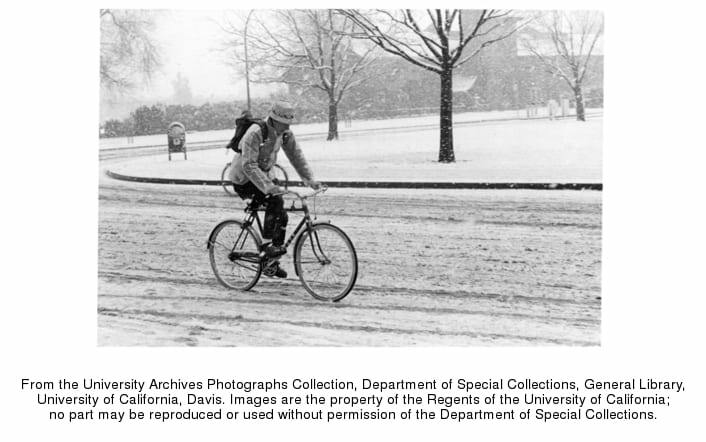 These images offer a visual record of the history of the University of California, Davis. The collection contains photographic prints and negatives, and depicts buildings and grounds, faculty and staff, annual events such as Picnic Day, campus events, classes and classrooms, student clubs and activities, departments, and sporting events. The images that are now available online are from the following series: Series 3. Annual Events, Series 5. Campus Events, Series 8. Student Clubs and Activities, Series 9. Departments, and Series 10. Sports. Images from Series 2. Administrators, Faculty, and Staff were the first group that went online last year. You can view these images on the Online Archive of California (OAC) by clicking here and we’ve posted one image from the group below. We are working on providing online images for the other series in the collection and will post announcements on the blog as those online images become available.